Space saving, low profile 3 or 10 Amp indoor/outdoor IP67 waterproof connectors from EDAC. Demanding applications such as LED lighting, medical, marine and hydroponic cultivation, along with a growth in outdoor and ruggedised applications, have prompted EDAC to introduce two new water and dust-proof wire-to-board and wire-to-PCB connector ranges. The new 560 and 572 Series connectors provide absolute protection against dirt, dust and immersion in water up to 1m depth for up to 30 minutes. Space saving, low profile 3 Amp or 10 Amp indoor/outdoor IP67 waterproof connectors from EDAC. Tested to IP67 for industrial applications. Installable crimped inline contacts or factory PCB contacts. Featuring double latches that provide a tactile double ‘click’ when fully mated, EDAC’s new E-Seal 560 Series connectors are exceptionally resilient to vibration. The new devices offer 2, 3 or 5 contacts in wire-to-wire and wire-to-board variants. EDAC’s ‘Fast Integral Seal’ technology provides waterproof operation. The seals, which are pre-assembled within the housings, are available to accommodate 1.0 to 1.3mm (yellow) and 1.3 to 1.7mm wire thickness (orange) and must be specified at the point of ordering to match the wire size in use. The new connectors feature a 2.5mm pin pitch and a current rating of 3A, 250VAC, with an operating temperature range of between -40º and +105º C. Electrical integrity is ensured by internal polarisation, eliminating the possibility of mis-mating the connectors. Wire termination is made with crimp ‘poke home’ contacts 20-22AWG or 22-28AWG. Hand tools are available for crimping and removing terminals, and contacts can be used with automated crimp machines. A waterproof cap seals any unused contact positions. Waterproof plugs are also available should one of the circuits not be used. Please ask us for further details or download the EDAC waterproof datasheets. Certified to IP67. They are not intended for use under continuous pressure. In consideration of the broad range of ‘rained on’ definitions, the industry appears to have agreed to a ‘test of immersion for 30 minutes, at a depth of 1 metre, or the equivalent air test at 1.45 psi. That is the Qualification Test. (Protected against the effects of temporary immersion between 15cm and 1metre. Duration of test 30minutes). To achieve IP67 in wire to PCB applications the PCB header will require potting to the PCB. Also featuring the same ‘peace of mind’ double latching as the as the 560 Series, EDAC’s new E-Seal 572 Series connectors offer 1, 2 or 3 contacts with wire-to-wire and wire-to-board variants. Wire seals, which are assembled onto each wire when crimping the contacts to the cable, are available in a choice of 4 colour coded sizes to accommodate wire diameters from 1.7mm to 3.1mm. Seals must be specified at the point of ordering to match the wire size in use. The crimp contacts are available in 14AWG, 16-20AWG and 20-22AWG. 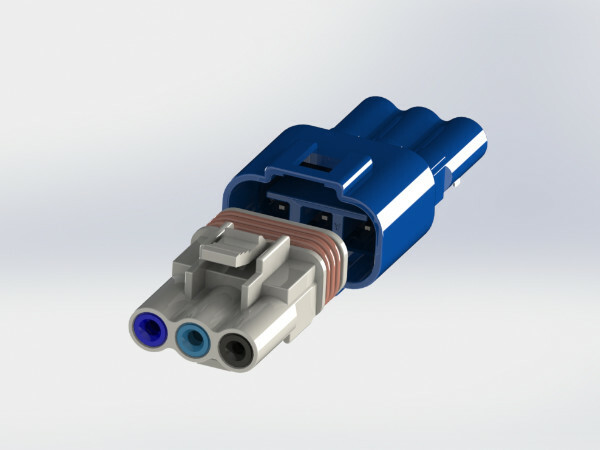 572 Series connectors have a 5.8mm pitch and a current rating of 10A at 300V AC and are rated for operation within the -40º to +105º C temperature range. Internal polarisation ensures electrical integrity.